Plus Size Kitten: Someone Lost Their IC at One Utama? Did someone lose their nric card at One Utama? it's at the Paid-Taxi Counter Stand outside New Wing now. 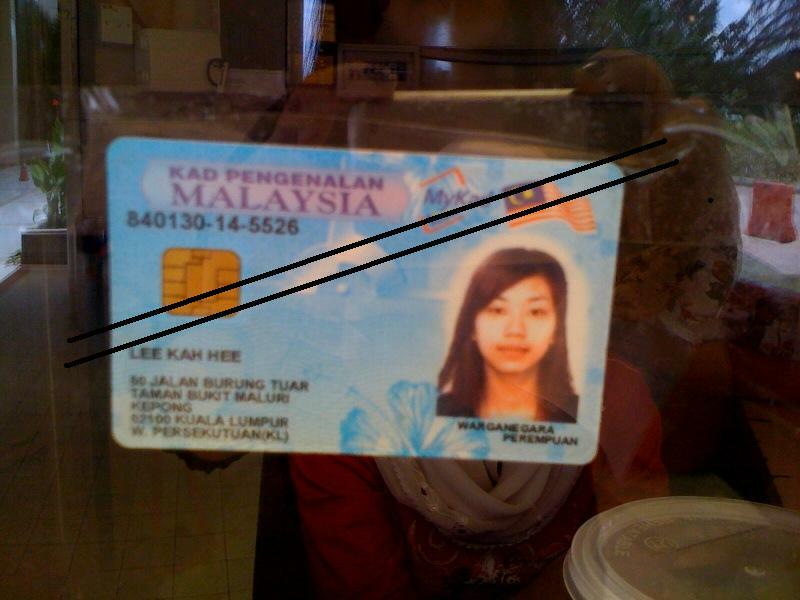 Person's name is LEE KAH HEE from Kepong. Anyone know her? give her a call to ask her take back her IC before she receive American Express Platinum Card Credit Card. Pretty girl somore this person. so nice of u !! who knows someone reading your blog might know her & hopefully get back her IC soon. God bless u for your kindness. You are such a good samaritan Miu. World needs more of such people. we should all be good Samaritan.. except when gangster is involved.. life more important k k..
Haze: ambik gambar using BlackBerry, upload to email, email i dl, n paparkan kat blog..cepat saja. plus i wish ppl would also do the same for me.. we need angels! ok ok i go tutup it..
funny part... platinum card??? lol! wah!!! small world!! i think she took back her ic oledi. The next day i go taxi stand check, the nric card not there anymore.